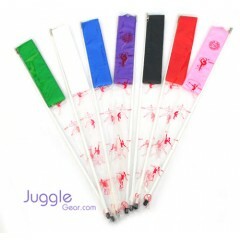 Twirling ribbons are also known as Chinese ribbons or gymnastic ribbons. Our 6m Fig ribbons are great for recreational to professional. Each ribbon is carefully crafted from top quality synthetic, and their satin finishes practically gl.. FIG certified, shiny, and lightweight! Each ribbon is carefully crafted from top quality synthetic,..